to shape and promote quality redevelopment and revitalization projects in the area along McDowell Road from Seventh Street to State Route 51. 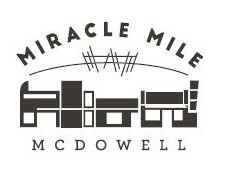 The Miracle Mile McDowell logo and brand represent the re-invented main street corridor, a growing community of local entrepreneurs who believe in the future of the area. McDowell Road Revitalization Committee focuses on revitalizing versus redeveloping the McDowell Road Commercial corridor. In conjunction with the appropriate City of Phoenix departments, including Community & Economic Development and Streets, the Committee is leading efforts to shape and promote quality revitalization projects in the area along McDowell Road from Seventh Street to State Route 51. As the northern bookend of Greater Downtown Phoenix, McDowell Road functions as a major artery between Downtown and Valley freeways, Banner – University Medical Center Phoenix, and to Coronado and Garfield historic neighborhood districts, offering tremendous commercial potential. For new Members, this Committee is extremely project-based with the ability to affect short and long-term changes to a major corridor between Downtown and Valley freeways.